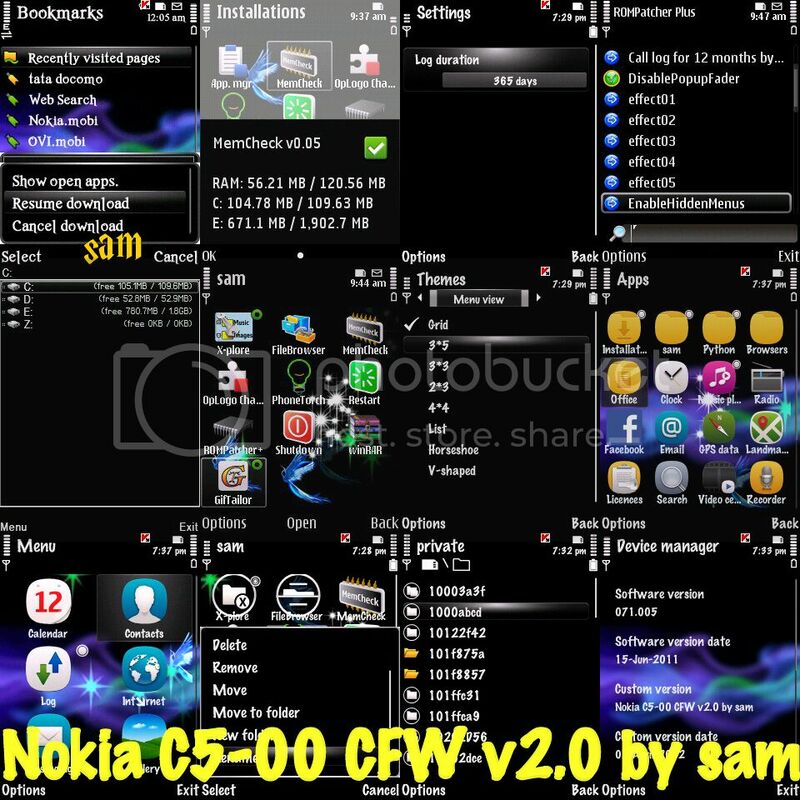 Hi Guys, I am again presenting an updated version of CFW for Nokia C5-00 users. Startup tone changed to that of Win7. Startup animation,Shutdown animation and splashscreens are changed and shutdown tone added. system folders are visible in Filemanager. Filemanager can send all type of files including protected,java,unsignd,etc. Menu features enhanced.You can move and rename anything. Press and hold of 0 key wil lead you to Phone Torch instead of Web. alarm setings modded and snooze time changed to 3 minutes. camera save RAM after closing it. camera quality increased to 100%. Annoyil Welcome SMS disabled and My nokia app removed. keylock time and backlight time adjusted. System Cache has been optimised. prodcast removed from music player. broken downloads are now resumable. summery after call turned ON. text size is set to small. Default Theme effect is changed. Mass storage is set as default in USB connection. voice sensitivity changed to full. reject call with SMS turned OFF and Speeddial turned ON. Please, dont forget this step while flashing. Here, before you press ' Refurbish button ', click on Option below and delete files like Rofs2,Rofs3,mmc content and other fpsx file. There should be only two files, Core and UDA. Ok guys, Don't forget to leave your results,suggestions,complaints,etc here or via PM. can you upload it again. please? Fake...only theme changes...And phone memory get extended....And nothing is changed...!!!! hello.. didn't u see the change log or features??. Those may not be directly visible. But will be in performance. And more phone memory is not silly. Is it??? ?